This extract from the ANC's website describes how Duma Nokwe "crossed into Bechuanaland" in January 1963, starting a period of active exile that would end with his early death at 50. "Facing a long period of imprisonment under the Unlawful Organisations Act for promoting the aims of the banned ANC, Nokwe was ordered by the underground leadership to leave the country. He crossed into Bechuanaland in January 1963, together with Moses Kotane. "Duma Nokwe's work in exile in the spheres of diplomacy and propaganda helped to win for the ANC the recognition and respect of the international community, and he was a well-known figure at meetings of the OAU (Organisation for African Unity) and the UN (United Nations), and the many conferences on South Africa called by various anti-apartheid organisations. "He was also one of the indefatigable team who presented the voice of the ANC over the radio courtesy of friendly countries, helping to win for the movement a widening audience in the heart of apartheid South Africa itself. Slowly, however, his health began to deteriorate, and his death in Lusaka on January 12, 1978, at the early age of 50 was the climax of many years of struggle to overcome the effects of serious illness. "Duma Nokwe was not only a staunch nationalist, but an equally staunch internationalist, a firm friend of the Soviet Union, who welcomed the support for the cause of liberation of the international communist movement and the progressive forces in all countries. Though small in stature, in spirit he was a giant whose political perspective embraced all humanity, and who linked the fight of the ANC with the anti-imperialist struggle throughout the world. "We have fought for years to get one of ours into the Bar. Are we now going to lose that over a cup of tea?" This lesson plan demonstrates to learners why minutes of meetings are good sources of historical evidence. Learners can also learn the valuable skill of taking minutes. 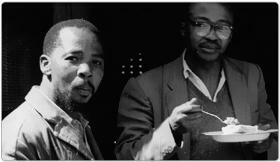 A selection of images of Nokwe’s life before he fled South Africa to escape the threat posed by the apartheid authorities. Nokwe’s widow, Tiny, and George Bizos reunite at the memorial outside the Johannesburg High Court. Take an illuminating 360° degree tour of the Nokwe memorial outside the Johannesburg High Court on Pritchard Street.